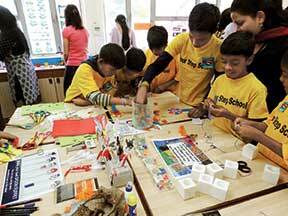 This year, the National Science Day at Homi Bhabha Centre for Science Education saw close to 1500 visitors! Amongst an array of activities that had been set up, the Design and Technology Lab put together a number of activities aimed at sparking creative expression and gave visitors an opportunity to think, make, and test. There were some “do-it yourself activities”, puzzles, illusions, and also a section on robotics. The activities were aimed at popularizing design and technology by giving a flavour of working with hands while using their imagination. Creative expression: Bead-activity, making pictures from letters of the alphabet, making pictures from fingerprints, craft work with scissors and coloured paper, Rangometry, making spoon puppets. 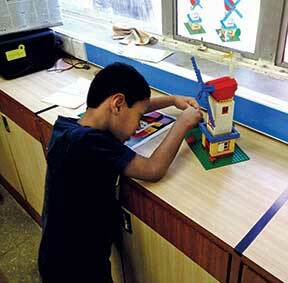 Do-it-yourself-activities: Making a skimmer, static tissue, flying fish and balancing bird (Arvind Gupta Toys). Gallery walk: 3-D projection of car, Lego building with windmill-model, star-puzzle, unusual artefacts: Can you guess what these things are? Paper art, bio inspired objects. Robotics section: KMK DIY Robotic (Ready-made) Kit, doodle bot, hydraulic arm (with syringes), bot car. Psychology activities: An activity to demonstrate the interference in the reaction time of a task, that is the stroop effect, and an activity to depict the theory of “Tragedy of the Commons”. Some posters on optical illusion were also displayed for students to observe and test their visual perception and limitations. Apart from that, several posters were put up across the lab for students to pen down their thoughts on science, maths, design and technology. Their responses revealed their interest and attitude towards the subjects, misconceptions as well as utility of the subjects among many other things. Since they were given a free reign to create anything, they went all out in creating some interesting artefacts combining resources from different tables. Their artefacts were displayed in the room for all to see and appreciate. 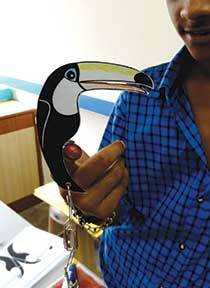 A grade 8 boy makes two spoon puppets and ties them back-to back. He then says – This is my friend. He has two faces. He is like this (turns to show the calm happy face) when he is with me and is like this (turns over and shows the evil smile) when he is not with me and talks behind my back. A primary class girl student was accompanied by her dad and she spent a good 45 minutes in the lab performing all the activities. Though her father was keen to take her to other laboratories, she was determined to finish the star puzzle. She spent ten minutes with it, completed it and only then left for the next room. One of the youngest visitors we had in our lab. 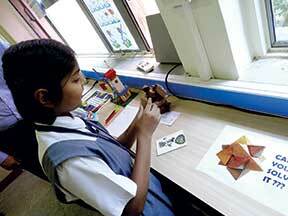 He spent an hour with his mother exploring all the activities and artefacts in the lab. We encouraged him to explore the place even after closing hours. His curiosity to explore the Lego blocks was contagious. He dismantled the Lego building to see how the windmill model worked and even made an attempt to fix it back the way it was! Often enough, kids were able to predict if their “balancing bird” could balance another u-clip. One activity that managed to engage all age groups- young kids and adults was the unusual artefacts counter. Visitors had fun guessing the uses of unusual-looking artefacts and spent several minutes with their peer groups discussing possible uses of the given set of items. Science is very nice, very easy. Design is made by human technology by his mind. Without designing you cannot make proper model or anything so designing is important. Maths is only a headache, nothing more, but for marks, “study”. Design helps us to think creative! Science is about discovering every second. Maths is all about thinking!! Design means creativity of life. Technology helps us to ensure our future. Science is everything, no compromise. For Design, we need technology. Science is very useful to us. Acknowledgements: Dr Sugra Chunawala, Dr Chitra Natarajan, Devashree Prabhu, Disha Gupta, Sonam Sawant, Pooja Sharma, Dr Shubangi Bhide. The author works at Homi Bhabha Centre for Science Education, TIFR, and is interested in science and society, socio-cultural issues, environment and sustainability education. She can be reached at adits.mdhar@gmail.com.